I decided to do a little scene with the tree. I have been wanting to use Nate's ABC's again and thought this was the perfect cartridge to add to the tree. 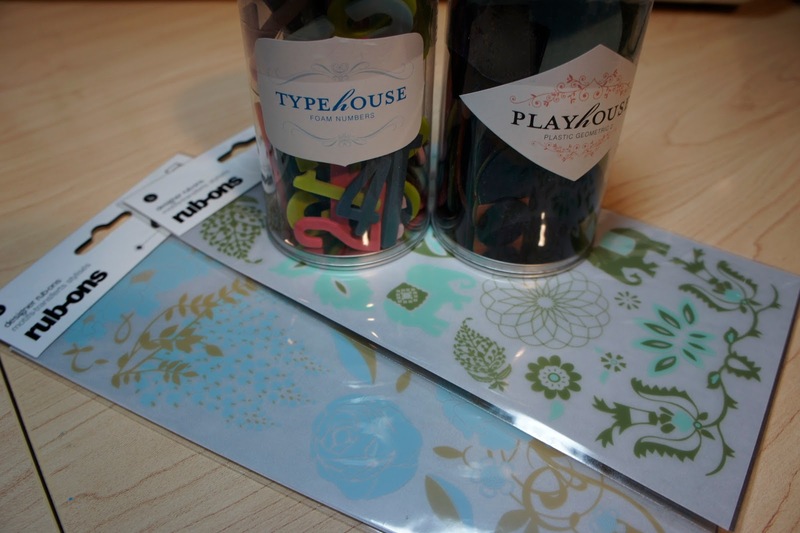 I also paired it up with a sentiment from My Pink Stamper's new release Sweet Goodness. I added a little detail work with real sewing and hand cutting some felt leaves. I hope you enjoyed what I did with the tree....now you are next. 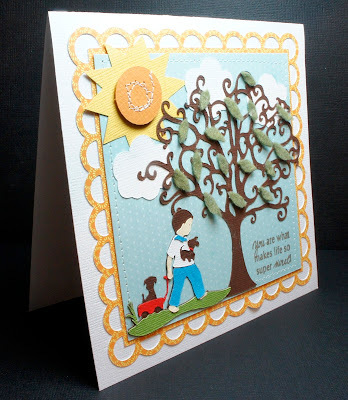 Join us in the challenge--make a project with the tree or any other Cricut tree and post it on the Bitten By The Bug 2 Blog. All you have to do is leave me a comment by 10PM Central Time on Wednesday, August 31st. I will pick a winner and post it on Thursday, September 1st. Please check back to see if you have won. I am starting a new policy on my Blog. If I have a give away I will be posting the winner, asking them to contact me with their info and I will send the prize. I will not track down the winner. Sorry I needed to make this change, but I feel that if people only come to my Blog for a give away they really are only interested in the give away and not the Blog....thanks for your understanding. 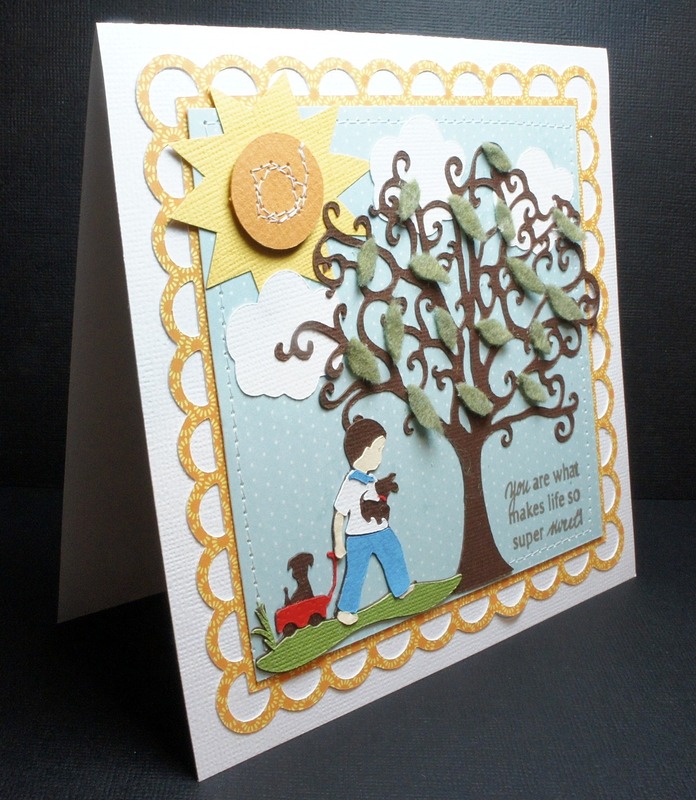 Heritage = Tree @ 4.29"
Elegant Edges = Frame @ 5.49"
Create A Critter = Clouds @ 1.35"
Nate's ABC's = Boy with Wagon @ 1.94"
Wild Card = Sun @ 4.41"
Another great project, I like the combination here. I don't have the heritage cartridge but love the tree! Absolutely adorable, Maria. 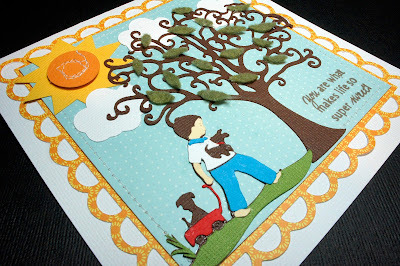 I just love the scene you created and those hand cut felt leaves are surely the perfect touch. ah I love it!!! So super cute!!! I am a new follower because I like what I see on your blog. I absolutely love your card!!!! So full of detail! TFS!!!! 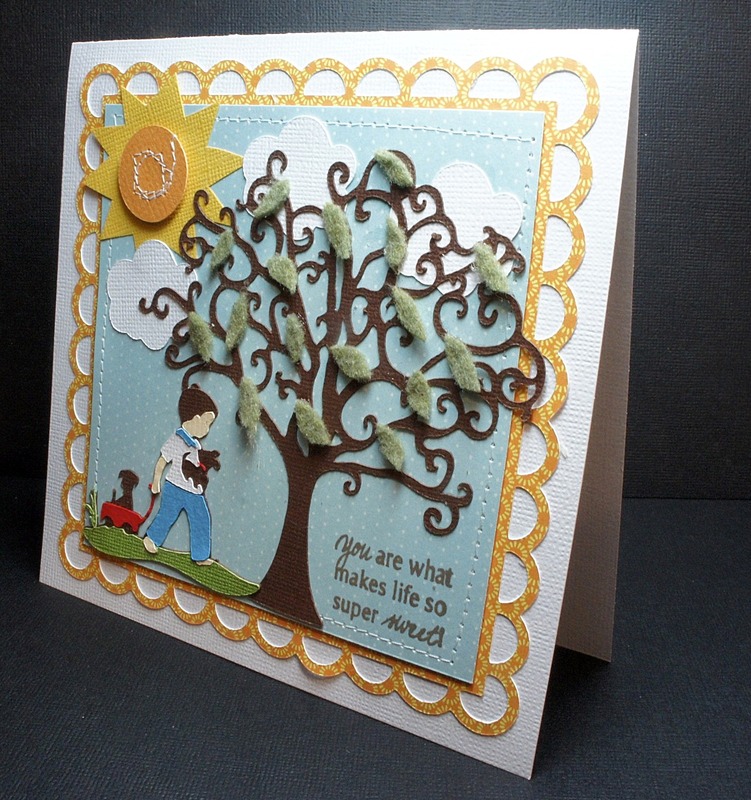 Gorgeous card.Love the scene and the sentiment.Great felt leaves too.Really happy to be your newest follower. LOVE your card! Its so cute the leaves are such a nice touch. thanks for sharing and the chance to win im a follower. Great dimension with the leaves on the tree. Lots of detail! Your work is always inspiring! Thanks so much for sharing! This is so pretty, the little boy looks great under that pretty tree!! super cute project. great work. tfs. This is really pretty. 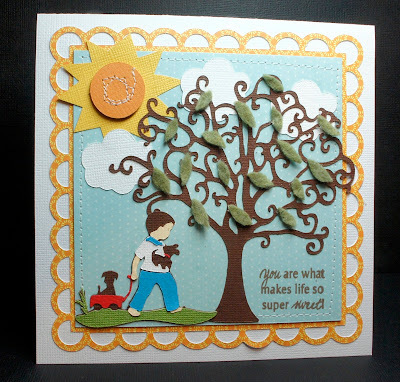 I love those papers together and the design is great , the sentiment really TOPS it off. Great JOB!!! OH P. S. I was wondering what paper you used it didn't say also I like your new policy!! Oh Maria, this is so sweet! What a great scene and such wonderful details!! Love the stitching and those leaves are great!! This is such a sweet card. 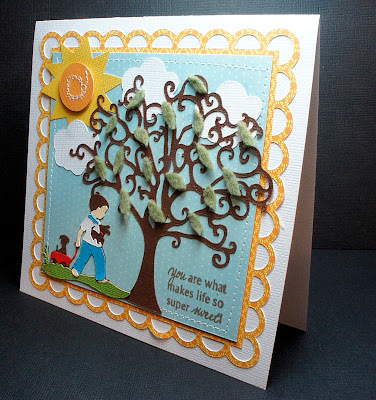 I love that you used felt to create the leaves. Lovely job. Love this card. Nate and Kate are two of my favorite carts. A wonderful card! Maria, this is stunning! I love the scene and all the details. The felt leaves are so cool. Awesome, awesome, awesome!!! You are so talented! Wonderful project, Maria. I love the entire design. This is so super sweet! Great tree and love the details! Oh this is such a lovely little scene, great use of the cut. As I am in UK I will understand if my comment doesn't get included for the giveaway. BEAUTIFUL card ! I love your sweet scene - your leaves really pop off your tree ! Great job !!! Simply elegant. There are no other words for it. This is beautiful. This is an adorable project. Love the leaves! I hope I'm not too late!! I love your project! Thanks for sharing!! Oh I love this wonderful scene you created Maria! So many fabulous details to take in! Love the felt leaves and your sewing is awesome! Brilliant take on the challenge! maria, loving your card....and awesome job with the leaves----great great touch!